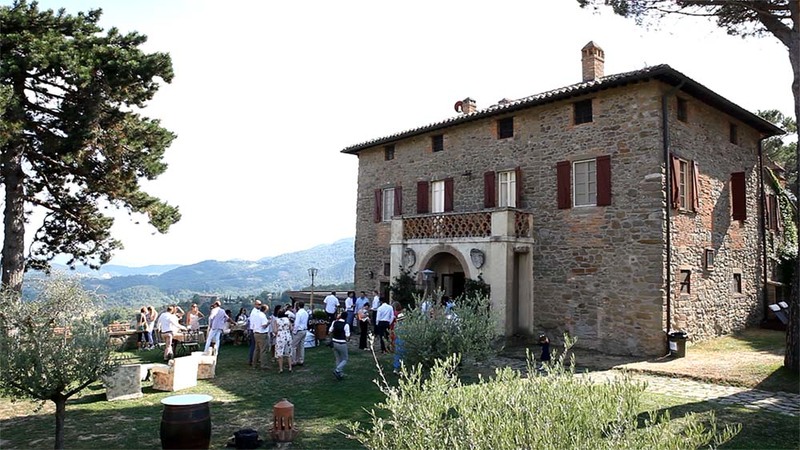 Here’s another amazing wedding reception party at: Tenuta di Casa Bruciata in Preggio, Umbertide, Umbria. A wonderful couple from England together with family and close friends, with the inestimable help of Gabriele and all the staff of the venue, are living a memorable day and an absolute amazing break from the city and the busy life!! Tenuta di Casa Bruciata is nestled hi on the hillside, over looking a lovely valley, one of the best view we have ever witnessed. On a clear day you can see the mountains in the distance. you’ll experience how life moves at an all together different pace in the Umbrian valleys. The whole set up at Tenuta di Casa Bruciata is perfect – relaxed, spacious communal outside space, a lovely pool area, plenty of seating areas to enjoy if you’re not keen on doing too many day trips to the nearby medieval town and villages (we warmly suggest Cortona, Gubbio, Assisi and a Trasimeno Lake tour including the beautiful islands Isola Polvese and Isola Maggiore). This hilly location is also great to get away from the stifling heat of the Italian summer to perfect daytime and comfortable nighttime temperatures. -> See here our special page dedicated to Casa Bruciata! 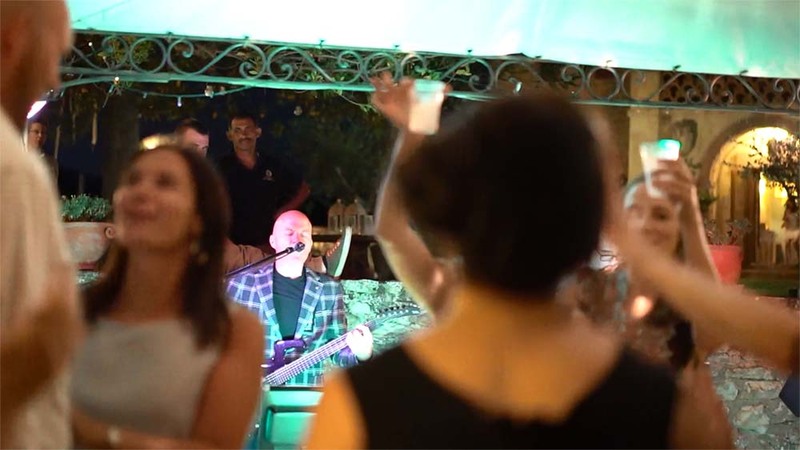 The following videos show the bride, groom and guests dancing to the live and dj music of Guty & Simone “the Italian wedding musicians and Dj” at Tenuta di Casa Bruciata. 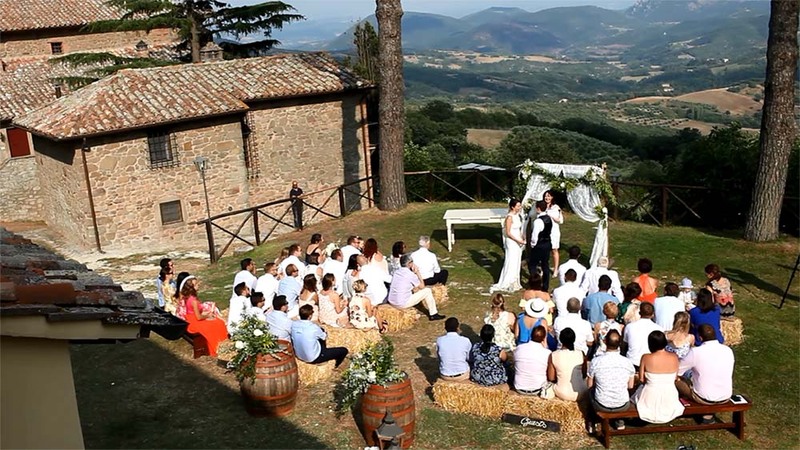 The ceremony takes place on the grass by the hamlet of Tenuta di Casa Bruciata. The aperitifs in the garden between the two main buildings, dinner inside the romantic “Infinity terrace” and after dinner in the dedicated area for the wedding party (where there’s also an open bar). Guty & Simone provide the right music soundtrack for the big day including background music + wireless microphone during dinner, live music + dj set during the after dinner wedding party + professional sound & lights system.